Posted by SC Comments Off on Marawhara and Wekatahi Streams – should they bother to separate? The Auckland Council has postponed planned works on North Piha Beach to separate the Marawhara and Wekatahi Streams. About 5 years ago the Marawhara pushed southwards to join the Wekatahi, and because the greater force of water coming down the former, it threatened to undermine Marine Parade North, just south of the bridge over the Wekatahi. After a community consultation, the streams were separated and a dune created and planted between the two watercourses. This has worked very well and the dune is substantial and stable. Recently the Marawhara has pushed south again and has joined the Wekatahi, but because the “manmade” dune has stayed intact, it is not undermining the road. 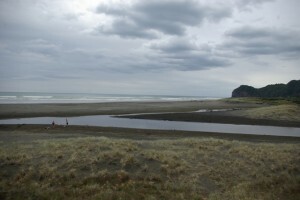 After representations from Piha Coastcare, Auckland Council consdiered undertaking works to separate the streams again. However, there were various objections from individuals and groups who pointed out that the stream was a long way from undermining the road, that the timing just before Christmas was undesirable and that generally, it was not good to use bulldozers in natural beach and stream systems. Historic photos show the stream has changed its course often. If the road is not threatened, why not leave it to see what nature does to sort the matter out? Below is the notice from the former Waitakere City Council. The Weketahi and Marawhara Streams have again rejoined together and now discharge to sea approximately 60 – 80 metres south of their original discharge points. The streams have recently cut across the face of the dunes on the corner of Marine Parade North removing part of the dune and the associated planting. Approximately 5 years ago the Weketahi and Marawhara streams were discharging as one and had cut very close to the corner of Marine Parade North. This threaten the use of the roadway which necessitated interference by Council to split the streams and move the sea outlets further to the north and away from the road. A consent was granted for this work and at the same time a ongoing maintenance consent was also obtained to allow periodic realignment of the streams to be undertaken when required to move the streams and reduce the threat to the roadway. Although the threat to the road is not imminent it is proposed to carry out the realignment works sooner to reduce the need for undertaking more substantial earthworks out on the beach. If weather and time permits It is planned to carry out the works prior to Christmas. There are restrictions within the consent on when and how the works can be undertaken and these will be adhered to. A change in the consent will be sought to enable the works to proceed before Christmas. If works can not be undertaken prior to Christmas then works will not commence until May 2011.